Not only did I post about J.Crew’s chore blazer (Blazer Chores), but I also picked up one for myself. The results are in, and I like it! Why did I like about it? At the most basic level It gave me the feeling that I was wearing a sport coat, but it dressed it down in a way that made it more acceptable to the crowd that does not like that type of thing. It also has a cool factor as chore jackets are definitely in at the moment. For us ivy guys it has great shoulders, a 3/2-ish roll, and patch pockets galore. Basically it is a more accessible Keydge (The Weejun on the Keydge) albeit a bit more casual than even a Keydge. So what is there not to like it about this blazer? In my opinion it does not look good buttoned. I don’t think it is just the cotton construction, but something about it reminds me of a lab coat when buttoned (see the pic directly above for reference). I wore it unbuttoned. It will also be tough to dress up outside of chinos and should be considered business casual at best. It does working cuffs which presents a problem for those that need them shortened. In my case the sleeves need to be shortened so much that it should not present a problem. 15 Comments on "More Chore"
Thanks for this timely post. I received this jacket in the mail a couple of days and was on the fence as to how it fits me. I purchased the 40 and I wasn’t sure if it felt too snug, even though I don’t even measure 40″ around the chest. Seeing how you wear yours confirms it for me… I’ll be trying the 42″ instead. Aside from fit I agree it’s a nicely made piece but is indeed very casual. Sorry Ox, I don’t care for it. In other words, size up a full measurement if you aren’t rail-thin? Randy – I don’t find very trim through the body. More so in the shoulders. Yep, the shoulders are where the jacket is most snug. I don’t think it looks good on you at all. I think your description of a lab coat is pretty close to what I think it looks like on you, buttoned or unbuttoned. Sort of looks like a denim lab coat (?). I don’t know. It just does not look “right”. You look good in Ivy and Preppy clothes and you should think carefully about trying to ruin what looks good on you by wearing stuff that is cheap in looks. It’s not a sport coat, and does not look like one. It looks like a shirt jac, which is fine (they are nice and rugged looking, but I don’t think that’s the look you are going for), but it looks like a shirt jac that is pretending to be a sport coat in the way that those t-shirts pretend to be tuxedos. It’s comical, not flattering. 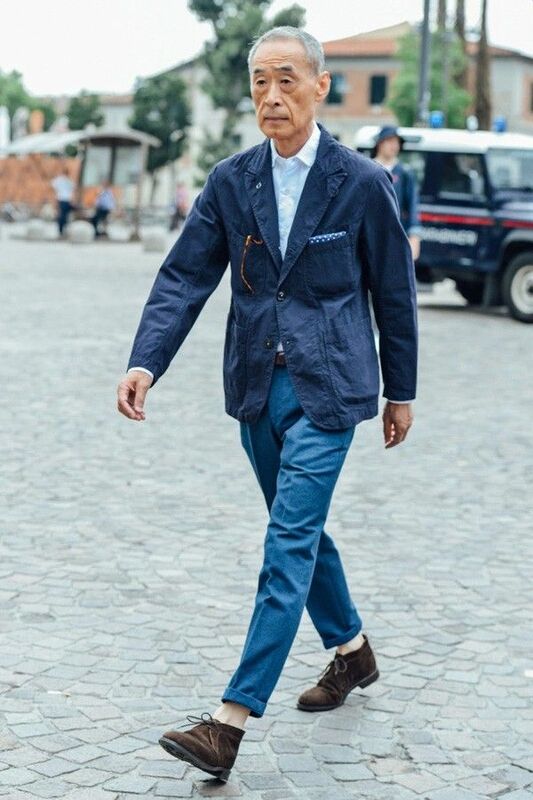 If you just want a low cost, wrinkle-resistant, not-care-what-happens-to-it blazer or sport coat, LL Bean and Orvis sell real nice ones that are relatively light weight and work great for casual or travel applications but are constructed and styled to look really nice. I don’t care for it either and would not wear one, but if you like it, wear it in good health. Life is too short to worry about silly things. Apparently Parisian street-sweepers dress better than the Average American male. I like the idea – but it needs tailoring to look great. I like the way the jacket looks on Noboru – fits well and it’s been properly tailored. But honestly, if that coat was provided by my employer to wear in the lab, I would love it… and my employer. We have to wear teletubby-looking plastic overalls in lab.